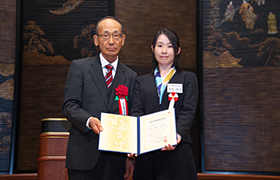 The Okawa Prize, Okawa Publications Prize and Research Grant Presentation Ceremony was held on March 7, 2018 at ANA InterContinental Tokyo. 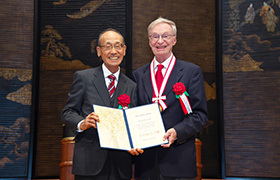 Dr. David J. Kuck (Intel Fellow / Professor Emeritus, University of Illinois at Urbana-Champaign) and Dr. Akinori Yonezawa (Director, Software Technology and Artificial Intelligence Research Laboratory, Chiba Institute of Technology / Professor Emeritus, The University of Tokyo) won the 2017 Okawa Prize for their contributions to research and development of software technology in the field of parallel computing. 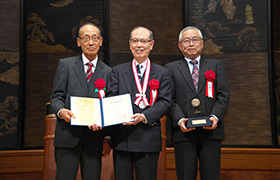 On March 8, the following day of the ceremony, International Symposium on the Future of High Performance Green Computing honoring the achievements of the Okawa Prize winners was held hosted by Waseda University and the Okawa Foundation. In the symposium, Dr. Kuck gave a commemorative lecture and renowned researches from the world talked about their researches. 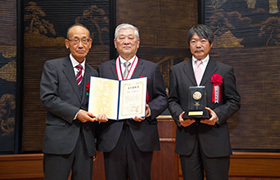 "Blockchain Revolution" (authored by Dr. Yukio Noguchi, published by Nikkei Publishing Inc.) and "Legal Minds on Information Law" (authored by Dr. Koichiro Hayashi, published by Keiso Shobo Publishing Co., Ltd.) received the 2017 Okawa Publications Prize. "Blockchain Revolution" explains whole aspect of blockchain as a basic technology of virtual money transaction, indicating its potentiality along with the social outlook. 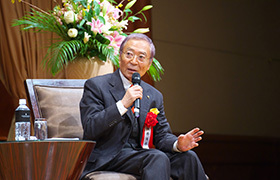 "Legal Minds on Information Law” locates “Information Law” as a basis in the information society and gives a panoramic view of the Information Law in the future. 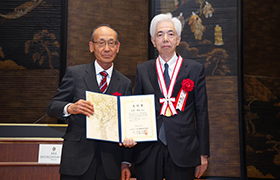 "Legal Minds on Information Law"
24 researchers from Japan and 8 researchers from China and South Korea received the Okawa Research Grant this year.